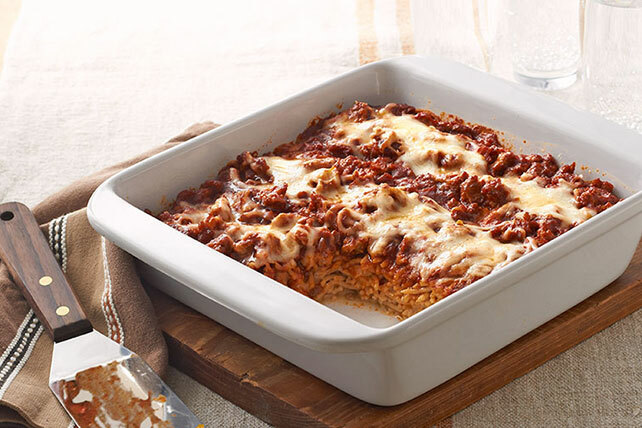 Discover this cheesy, saucy Spaghetti Bake with everything you like about lasagna except the unwieldy noodles. Try this Spaghetti Bake recipe this week! Cook spaghetti as directed on package, omitting salt. Meanwhile, remove and discard casings from sausage if necessary. Crumble sausage into medium skillet; cook on medium heat until done, stirring frequently. Drain sausage; return to skillet. Stir in pasta sauce; simmer on medium-low heat 5 min., stirring occasionally. Drain spaghetti; place in large bowl. Add egg, Parmesan and 1 cup mozzarella; toss to coat. Spoon into 8-inch baking dish sprayed with cooking spray; top with sausage mixture and remaining mozzarella. Make dinner preparation a family affair. Match your kids' skill levels with various tasks for safe kitchen fun. When preparing this tasty recipe, let the younger children open packages, measure ingredients and beat the egg. Older kids can stir the sauce and help assemble the casserole.